Trilogy at Lake Frederick is an active adult community in Northern Virginia. Formerly known as Shenandoah, Lansdowne Development Group acquired the master-planned community of Lake Frederick and this 55+ neighborhood within it was renamed with Shea Homes popular active adult brand, Trilogy. Homebuyers can select a previously owned home or a Shea Homes new construction that offers low-maintenance living in a resort-style setting. The current clubhouse complex contains two distinct buildings and boast some of the best resort-style amenities in the region. With boat and fishing access on a sparkling lake beside the Blue Ridge Mountains, Trilogy at Lake Frederick is thoughtfully designed to support active adults with a wide variety of interests both indoors and outdoors. The Shenandoah Club complex consists of two buildings with a total of 36,000 square feet of indoor space. Residents have access to resort-caliber amenities that include a state-of-the-art fitness center complete with an indoor pool and exercise studio. This centerpiece of the community has an art studio, ballroom, meeting rooms, demonstration kitchen, restaurant, bar, private dining room, game area, and golf video simulation room. Trilogy at Lake Frederick is an outdoor-centric community situated on a 117-acre lake that offers fishing, paddleboarding, and kayaking. Residents will enjoy staying fit outdoors with a resort-style pool along with tennis and shuffleboard courts. Parks and natural space, as well as walking and biking trails, can also be found throughout this community that sits on 900 acres of scenic land. The Oxbridge Group began development of this 55+ community in 2006. It was originally known as Shenandoah and multiple builders including Winchester Homes, Beazer Homes, and Centex Homes built 172 residences. These single-family and attached homes built between 2006 and 2013 can be found in resale inventory. In 2013, the community was sold to Lansdowne Development group who is currently planning the entire Lake Frederick master-planned community. Shea Homes opened Trilogy at Lake Frederick in the summer of 2014 and is offering eight thoughtfully designed floor plans on a new construction basis. The Valley Collection by Trilogy offers four unique floor plans. These plans range from 1,538 to 2,057 square feet. These homes offer two to five bedrooms, two to four bathrooms, and an attached two-car garage. Many plans have multiple options as well as a den for additional living space. The Piedmont Collection includes five models: Aspen, Refresh, Nice, Elate and Hampton. These homes have between 1,678 and 2,628 square feet of living space. There are a variety of customizable building options that offer two to five bedrooms, two to four bathrooms, and an attached one or two-car garage. The Blue Ridge Collection features two models: the Elate at 2,151 square feet and the Hawthorne at 2,628 square feet. Also with many options, these homes contain two to five bedrooms, two-and-a-half to four bathrooms, and an attached two-car garage. Shea Homes is a reputable homebuilder that builds every home with energy-efficient and quality construction, contemporary kitchens, and luxurious bathrooms. Residents of Trilogy at Lake Frederick have many different interests. Some are retired, but many are mid-career or pursuing new opportunities. With 19 colleges and universities located within 60 miles, actives adults who live in this Northern Virginia community can easily choose to continue their education. 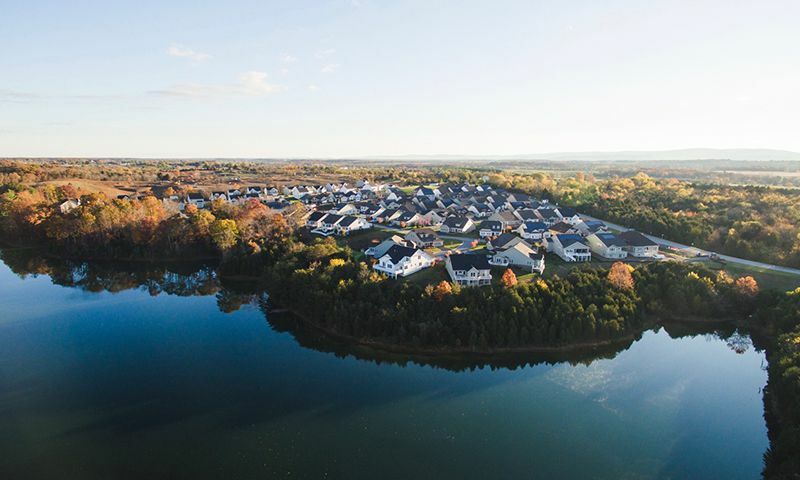 With a diverse mix of homeowners, Trilogy at Lake Frederick has been designed to meet to a wide range of interests and lifestyles. Residents can get to know their neighbors while pursuing their individual interests throughout community activities and social clubs. A few of the popular social clubs include groups that play bridge, bunco, poker, or board games. Special interest groups meet to hike, garden, and kayak as well as discuss topics in a bible study or history club. Set in the Shenandoah Valley, in the heart of Northern Virginia s Frederick County, Trilogy at Lake Frederick enjoys a popular location alongside the beautiful Blue Ridge Mountains and spectacular lake. With a secure, gated entrance and wooded areas Trilogy at Lake Frederick provides a protected, close-knit community in the midst of nature. Though Trilogy at Lake Frederick has a rural setting midway between Winchester and Front Royal, it is also within close proximity to more urban areas. Washington D.C. is 90 minutes away and the community is only one hour from Dulles International Airport. The main entrance is just minutes from Interstate 81 which makes it easy to travel outside of Shenandoah Valley. A great location combined with an enviable lineup of amenities and thoughtfully designed homes makes Trilogy at Lake Frederick a popular 55+ community in Northern Virginia. Shenandoah Club - 36,000 Sq. Ft. There are plenty of activities available in Trilogy® at Lake Frederick. Here is a sample of some of the clubs, activities and classes offered here. Trilogy offers two models in the Blue Ridge Collection. These homes have customizable features that offer two bedrooms, two-and-a-half bathrooms and an attached one or two-car garage. The Baldwin plan also offers a den for additional space. These single-family homes have between 2,678 and 2,628 square feet of living space. The Piedmont Collection by Trilogy homes features three floor plans. These homes range from 2,270 to 2,664 square feet. They typically offer two to four bedrooms, two to three bathrooms and an attached two-car garage. All floor plans come with a variety of options and also offer a den for additional living space. The Shenandoah Collection by Trilogy offers four different floor plans. These plans range from 1,678 to 2,628 square feet. These homes offer two to four bedrooms, two to four baths, and an attached two-car garage. These homes also offer additional living spaces like dens and flex rooms. Attached homes offer between 1,668 and 3,617 square feet of living space. Offered on a resale basis homebuyers can select a residence that has two to three bedrooms, two to three-and-a-half bathrooms, and a two-car garage. Please Note: Attached home floor plans are not available at this time. When this active adult community was known as Shenandoah, multiple builders including Beazer, Centex, and Winchester Homes constructed about 165 homes between 2009 and 2013. These homes can be found on a resale basis. Please Note: Not all resale floor plans are displayed below. I love Trilogy at Lake Frederick. The home designs are superb and Shea Homes was a pleasure to work with. We just finished our clubhouse and I still can't believe how nice it is. I loved living here before the clubhouse, but it is so nice to go to the clubhouse for aerobics, exercise, and the clubs I belong to. I have lived in 8 different communities, but this one is by far my favorite!! 55places.com is not affiliated with the developer(s) or homeowners association of Trilogy® at Lake Frederick. The information you submit is distributed to a 55places.com Partner Agent, who is a licensed real estate agent. The information regarding Trilogy® at Lake Frederick has not been verified or approved by the developer or homeowners association. Please verify all information prior to purchasing. 55places.com is not responsible for any errors regarding the information displayed on this website.